I’ve taken a detour from San Francisco deeds, which was my detour from Azorean church records. 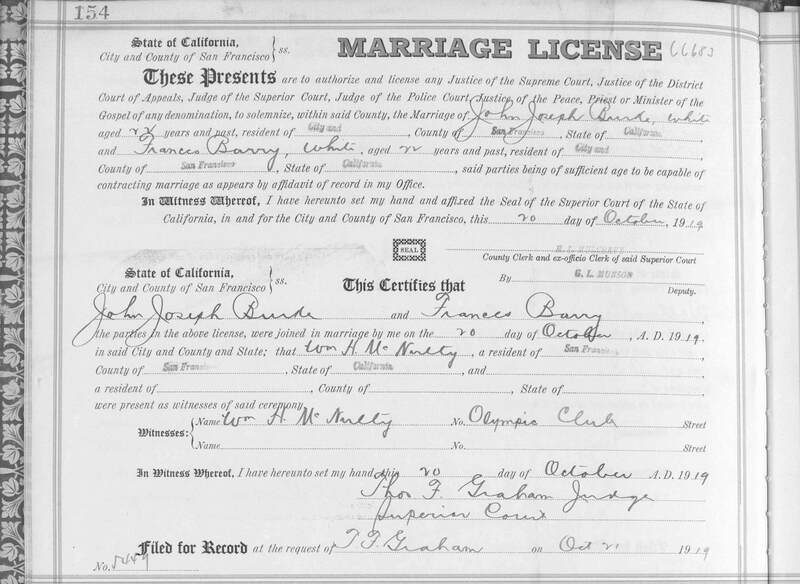 I became possessed with the desire to find San Francisco marriage records. So, I decided to work on those for a few days. I wanted to find my grandmother’s cousin’s first marriage record. I don’t know when he was married but figure 1919 would be a good place to start. John J. Burke married someone only known as Frances. It always bothers me when I have no maiden name for females. It is my personal mission to get as many of my ??? (my way of noting surname unknown) women their rightful maiden names. Today was the day to figure out who Frances was. The records can be found at www.familysearch.org under San Francisco County Records, 1824-1997. Select Marriages. FamilySearch does not provide an index to these records, however, there are index books within this collection. Finding marriage records in this collection will be a two or three step process–even if you know the marriage date. First, you need to search the Groom or Bride index. The reason is that this entry will give you the marriage license book and page number and/or the state certificate number also referred to as the local registered number, depending on the year you are searching. Earlier entries do not have the state certificate number. Your next step depends on the era. If this is an early entry (I’m not sure what the breakdown is yet), you will need to search the marriage license book by page number. This is the stamped number at the top of each page. The marriage licenses will have some information that is on the marriage certificate but not everything a genealogist could ask for. The name of the parents is missing from the marriage license, for instance. On the marriage license there is a No. field at the bottom of the record. Or, with earlier records, a number will be typed or written on the record. That number refers to the number of the marriage affidavit (on early records). If your entry is later, you may see the state certificate number written in the Bride and Groom index entry. This is the number in the “no. _____” field at the bottom of the license. It is the same number as the local registered number on the marriage certificate. If you have a later entry, you can skip the marriage licenses and go directly to the marriage certificates. Their are many books for each year of marriage certificates. You’ll have to guess where to start. They are in order by state certificate/local registered number, so that is a help. I began my search in the groom index for 1919. You might have guessed it. There are several John Burke’s listed. I made note of all of them since I am not entirely sure Frances is Frances real name. It took me quite awhile to find the right entry for John J. Burke and Frances ???. The B’s start in the proper section, but evidently the transcriber ran out of room and decided to continue them at the back of the book. Of course, the entry I needed was in the back of the book. This gives me the state certificate number and the book and page of the marriage license. I could jump directly to the marriage certificates, but I want to have the marriage license for my files, too. The marriage licenses are organized by page number. You see it stamped in the upper left hand corner (154). 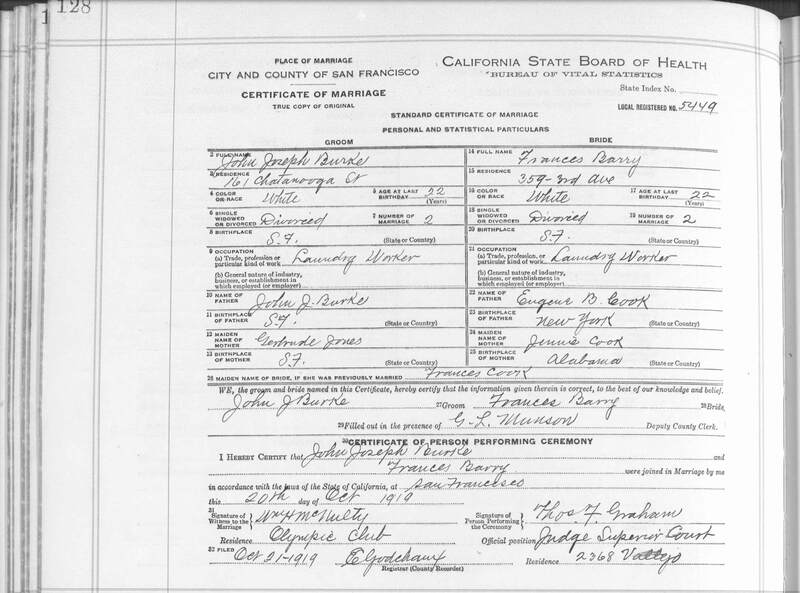 This is the marriage license for John and Frances. You can see that the no. field at the bottom of the certificate refers to the state certificate number. Next, I went off to find the marriage certificate. There are eight books that cover 1919. I picked the second to last one since the marriage took place in October. The book is in order by certificate number. And, it doesn’t seem like all the numbers are there. I flipped around until I found the certificate number 5449. This is the certificate for John and Frances. Once I saw the name of the parents, I knew that this was my couple. John’s parents were John Burke and Gertrude Jones. Did I learn anything from these records that I didn’t already know? Actually, yes. I didn’t have their exact date of marriage to begin with. I have that now. I knew that John was divorced, but I did not know that he was divorced before he married Frances. Now I have to figure out if his other wife, Mae, was before Frances or if he had another wife. I also figured out Frances’ maiden name and I got her surname from her first marriage to boot! Her parents are listed as well. I feel some satisfaction from going through this process and finding the record I was looking for. A lot more satisfaction than finding nothing, that’s for sure! I can fill in a few blanks in the Burke family group sheet. I’d say it was an evening well spent. Helpful hint: The organization of these books on familysearch.org is daunting and confusing. You will find that some indexes start, then there are other marriage records, and then more indexes. Also, some entries are labeled Marriage Certificates/Licenses, but then there is a separate section labeled Marriage Certificates and another one labeled Marriage Licenses. Also, there are the Marriage Affidavits, which are the early equivalent to the marriage certificate. Be prepared to open several links to find what you are looking for.